With International Speaker, Brad Whitworth, ABC, SCMP, Fellow. Artificial intelligence, virtual reality, bots, blockchain and other emerging technologies are changing the business world – and our personal lives. In a digital economy with technology developing at a rapid rate, it’s vital that we, as communicators, understand these technologies and the skills we need to work with them. A changing world offers a lot of opportunities, as well as challenges that we need to be able to navigate. Business communications expert Brad Whitworth is no stranger to emerging tech. As a senior communicator in Silicon Valley, he is well versed in integrating innovations into communication programs. At this special event, Brad will be giving us the download on the latest tech trends, how they impact us as communicators and the ways that leading technology companies are putting technology to work. in the world’s epicentre for innovation. Note: This event is tailored for mid and senior level communicators. However communicators of all levels are welcome. See who else is going. Tickets available until February 18. 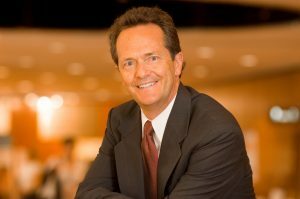 Brad Whitworth, ABC, SCMP, IABC Fellow has been leading marketing and communication teams at some of the biggest tech firms in Silicon Valley for three decades – always finding ways to integrate innovation in his communication programs. He started his Silicon Valley communication career the year before IBM launched its first personal computer. He is currently a senior internal communications manager at Hitachi Vantara. Previously he has been at HPE, Cisco, PeopleSoft and HP. He holds undergraduate degrees in journalism and speech from the University of Missouri and an MBA from Santa Clara University. As a global leader, former broadcaster and communications expert, Brad is a highly sought-after speaker on business communication. He has made more than 300 presentations at communication conferences, workshops, and seminars all over the world. He also has a track record of activities with CNN, Wall Street Journal, BBC, BusinessWeek, NY Times, Nikkei, USA Today, SJ Mercury News, Bloomberg, CBS, and others. For IABC, he’s a past chairman of the International Executive Board, past president of two chapters, has been a chair for various international task force’s and committees – and he is a contributing author to both The IABC Handbook of Organizational Communication and IC Kollectif’s Disrupting the Function of IC. He’s also been the resident “voice of God” for World Conference.